UML Class Diagram is a type of Structure Diagrams that shows the classes of a system, attributes, operations, and the relationships between them. Class Diagram is one of important types of UML Diagrams. UML Class Diagrams are used for static modeling of the system, for data modeling, for conceptual modeling of the application, and for modeling of the system dictionary. On the Class Diagram, Classes are represented as boxes that consist of three parts: name, attributes of the class, and operations or methods. Protected (#), Derived (/), Static (_), Package (~). Notation must be placed before the name of class member. There are a few types of associations between objects and classes on the Class Diagrams. Bi-directional associations are represented by a line between two classes, it is default connection between classes. Uni-directional associations are represented as the unbroken lines with an open arrowhead. Aggregation is an association with the relation between the whole and its parts, and is represented as empty diamond on the Class Diagram. Composition is a strong variant of aggregation, represents on as filled diamond. Generalization or inheritance is when a child object or class assumes all properties of his parent object or class, is represented as empty triangle. There are four notations: 0..1, 1, 0..*, 1..*, that indicate the multiplicity of associations. 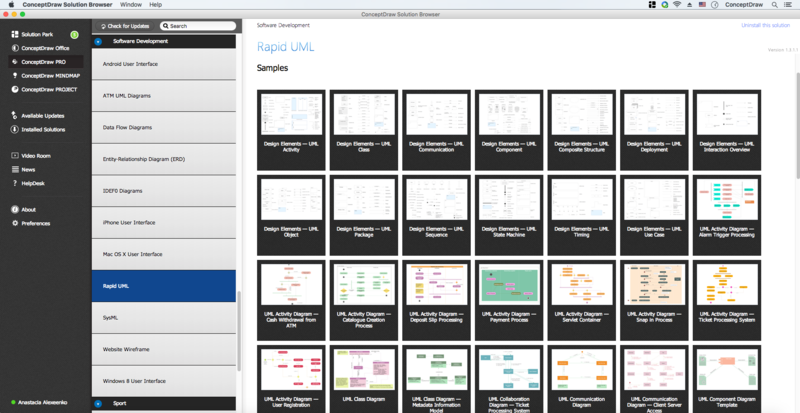 The Rapid UML Solution for ConceptDraw DIAGRAM contains 13 vector stencils libraries with 393 interactive shapes that you can use to design your UML diagrams. 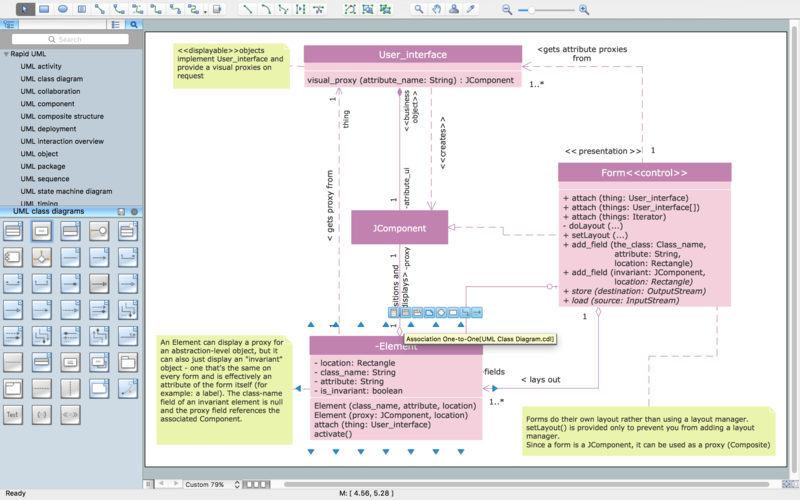 To design your own Class Diagram use the UML Class Diagram library. ConceptDraw Rapid UML solution provides UML Class Diagram library of vector stencils for drawing the class diagrams using class blocks and assembly connectors. Use design element from the UML Class Diagram library to draw your own UML class diagrams of complex systems and software applications. When it comes to system construction, a class diagram is the most widely used diagram. UML Class Diagrams is a type of static structure diagram that is used for general conceptual modeling of the systematics of the application. Such a diagram would illustrate the object-oriented view of a system . The object orientation of a system is indicated by a class diagram. It describes the structure of a system by showing the general issues,classes of a system, attributes, operations, interfaces, inheritance, and the relationships between them. There are many ways to track the system in a critical situation. To model a system behavior, uml notation is widely used. Usually, an UML diagram consists of elements such as actor and a case. This diagram represents the structure of UML notations. Unified Modeling Language (UML) is used in software engineering to depict graphically the software modeling process. 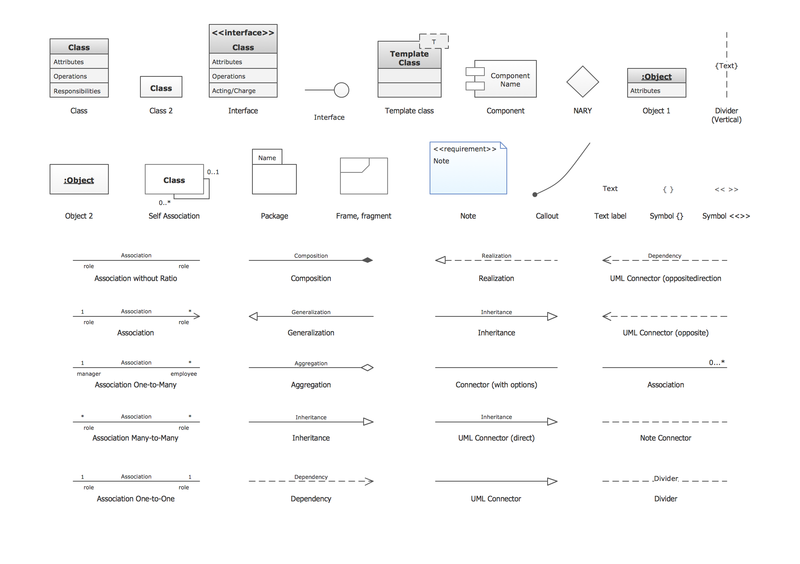 UM Language uses graphic notations for developing models of object-oriented systems. These notations displays requirements, sub-systems, logical and physical elements, etc. 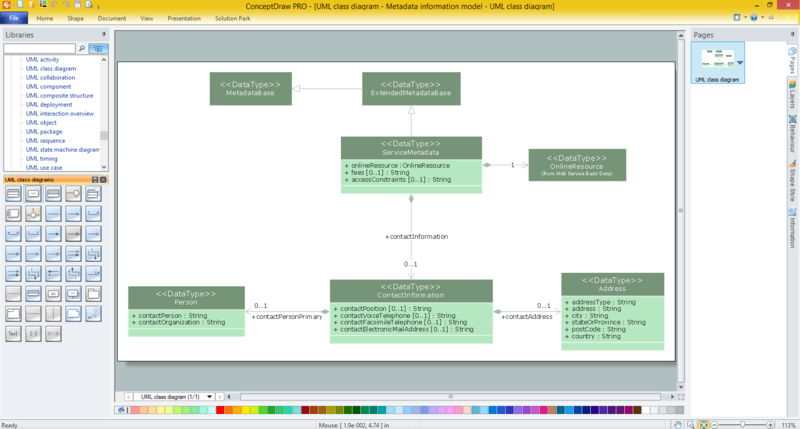 We created this diagram using ConceptDraw DIAGRAM v12 reinforced with Rapid UML solution. It can be helpful for students on software engineering, when learning UML. ConceptDraw DIAGRAM v12 extended with the Rapid UML solution is perfect for drawing professional UML diagrams. This sample was created in ConceptDraw DIAGRAM v12 diagramming and vector drawing software using the UML Use Case Diagram library of the Rapid UML Solution from the Software Development area of ConceptDraw Solution Park. This sample shows the types of user’s interactions with the system and is used at the registration and working with the database system.